You know how fast the times are changing…with new challenges, new variables, new developments, the life our children would be living is going to be immensely different from what we have lived. Think of a 9 or 10 year old child. Cast their life forward 20 years. It will be the year 2038. That child will be about 30 years old, making his or her way in a job somewhere. But what sort of job? What kind of skill set would be desired at that time? What do we know today about how to prepare that child for the future? The chances are the jobs you know best today will be different or may not even exist in 2034. And what may take their place is uncertain. 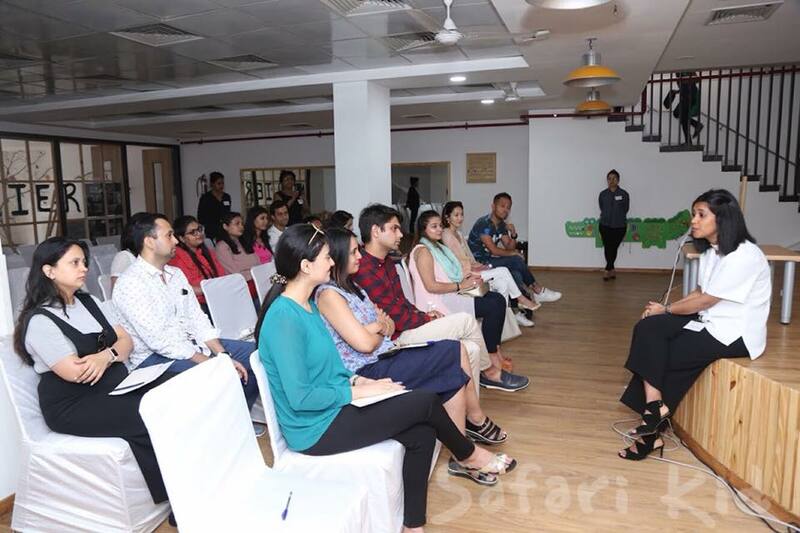 With such questions and uncertainties in our minds, we recently got an opportunity to attend a workshop- ‘Visual Thinking’ by Ms. Thasin Rahim at Safari Kid Preschool, Gurugram. She is a prominent teacher and researcher specializing in Early Childhood Education. With a nomination in 2015 Global Teacher Prize (the “Nobel prize” of education), she holds a place among the 100 best teachers in the world. 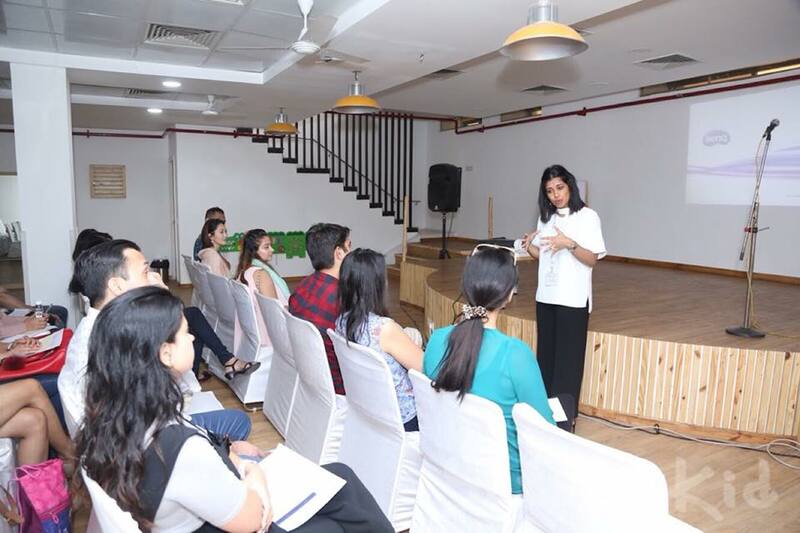 As the Chief Academic Officer of Safari Kid preschool, she conducted this workshop to talk about the challenges of 21st century, the ‘third teacher’, role of spaces, relevance & development of active methodologies (like Waldorf, Reggio Emilia and Montessori) and the role of teachers and parents in preparing our children to be future ready. The discussion began with Safari Kid’s core belief in an effective, constant and personalized communication between teachers & parents. They intend to involve Parents at each step not only to witness their children’s work but also to help parents integrate the learning methodology at home so that it becomes a part of the child’s life. With this in mind, they would be carving out the Learning spaces in the school into Literary, Math, Robotics Lab, Language and Atelier zones. The idea is that the child would move from one learning space to another at regular intervals. It would not only help inculcate resilience in the child but also break the monotony of being constrained to one space. 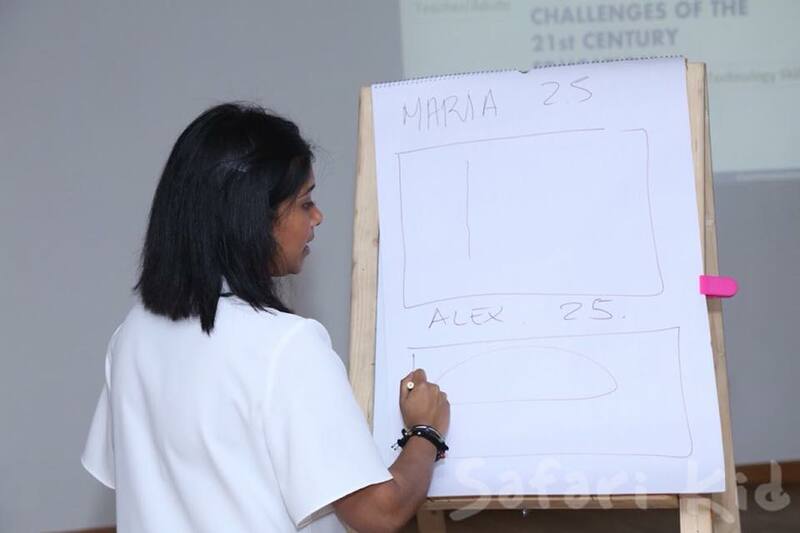 To this, they are working towards enhancing the role of teachers in the classroom of the 21st century. From being the “deciders’ or “instructors”, teachers would be expected to be co-creaters of knowledge and mentors. The idea is to give autonomy to the child to be involved in an activity of his or her own interest and learn through the process (and not through the end result). This is again a very distinctive approach that the school has adopted. Each child would be shown his/her progress through the day in terms of activities done by way of photographs and videos. The last part of the program (end of the day) would be dedicated to this way of learning feedback. Not to miss the fact that this is a wonderful way of making the child feel proud & confident! Enough has been written about the benefits of most popular methodologies like Decroly, Waldorf, Reggio Emilia and Montessori. But if each these is seen in isolation, one may find some grey areas in the ideologies of each. For example, Montessori doesn’t believe in fairy tales… So what about igniting the child’s creativity! Reggio Emilia offers an inspiring approach and talks about importance of art & story telling. But where’s the scope of thinking for the child? Moreover, a pragmatic approach to learning would make you wonder how are we trying to incorporate an ideology/methodology developed in the 1950s to be relevant in the 21st century. Of course it isn’t! Thus the new curriculum at Safari Kid Preschool aims at taking the best features from all these methodologies and creating relevant connections for the 21st century; developing core values with the background of these approaches to make our children future ready. When we talk about raising future ready kids with relevant life & social skills, we are referring to skills like critical thinking, conscious planning, imagining, and reminiscing. And this is where a holistic, non-linear thinking comes into picture. Based on what is emerging and changing now, we can say easily say that more elements of work and life will use visual communications in the coming years. 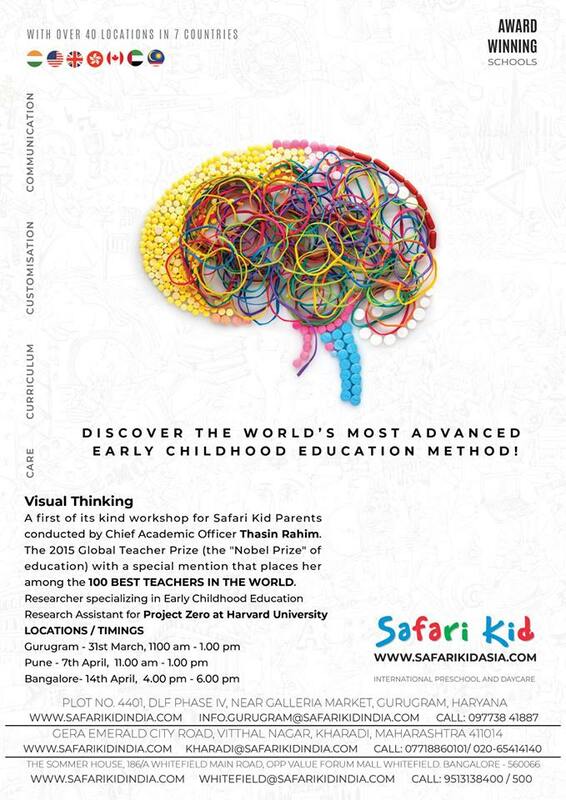 With this view, Safari Kid aims at incorporating Visual Learning as a medium of learning for kids. The most common misconception that we Parents had during this discussion was that Visual Learning is all about using less words and more illustration and drawing. But in reality, it’s about integrating the spatial and linear details of an image or picture or an object. Visual thinking is a way to organize your thoughts and improve your ability to think and communicate. It’s a great way to convey complex or potentially confusing information. The mind is an extremely flexible instrument. No matter what you do, our minds can process information and finds patterns. We can’t help but see and assign meanings to that. And that’s what is the crux of Visual Thinking. I don’t know if I can justify explaining this concept in words, but an easy example, which Ms Thasin showed us was a picture of 2 balls- Basketball & Football. Talking about similarities or differences between the two, we could go on & on – for example, their colour, texture, size etc etc. But if a person is skilled at visual thinking, he would think about various other aspects- like the sports associated with balls, number of players required, popularity of those sports, the objective etc etc. Basically Visual Learning allows our mind to process the different pieces of information in a non-linear way. I believe the workshop was a great way of involving parents to get a deeper insight into the curriculum being followed at Safari Kid. As a Parent I was introduced to a variety of thinking routines, what they are and how they are used to create more thought in Safari Kid classrooms. You may read my experience and get a sneak peek into the school by clicking here. You may book a tour to experience what Safari Kid Preschool is all about by clicking here. This is so interesting that environment plays an important role in how we process information.. also completely agree with you on non linear thinking and the jobs of future. I agree that the jobs that exist today might become redundant tomorrow. Digital cameras wiped out an entire industry overnight. Never know what comes next. It is a good idea to nurture a child’s personality more than a particular skill level. I’m glad there is an active programme that recognised the need for this. Thanks for this information! It is good that the pre-school is keeping education with a child centric approach. I like the whole idea of keeping a pragmatic approach towards learning and adopting the best practices of various schools of thought. this is good read indeed. I hope all preschool follow this approach. a visual approach is definitely the best way of learning.